Congratulations to the boys and girls cross country teams on an excellent performance at the state meet! 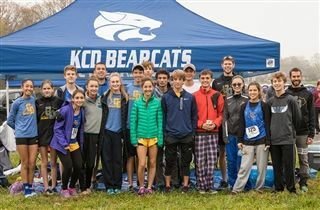 The boys team finished eighth in the state, while the girls team finished eleventh overall. This marks the third consecutive season that the boys and girls squads have both qualified and placed in the state championships. Top performers for the girls were seventh graders Haley Schoenegge and Mya Collins, placing 16th and 22nd respectively, making this the best KCD state finish since 2007. Haley and Mya were also named to the Class A All State team. The boys had two top-50 finishers in Ben Clift (30th) and Henry Starks (41st). Congratulations to Coach Copley, Coach Roberts, Coach Schoenegge, and the Running Bearcats on a fantastic season!